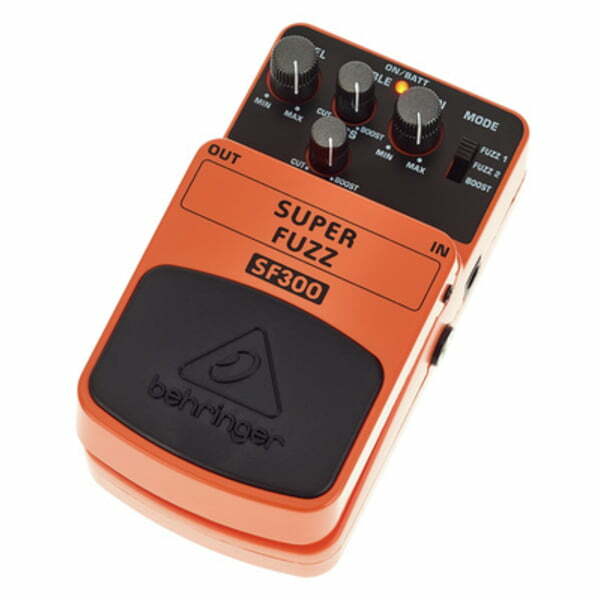 If the raw, Neanderthal power of history?s nastiest stomp boxes inspires you to plug in, turn on and rock out, it?s time to expand your mind with the SUPER FUZZ SF300. Three Modes of Operation With the SF300?s three unique sound modes you can: channel the grittiest tones of underground proto-punk legends; update your sound into a crunchy industrial cacophony; or opt for a pure gain boost that will make your amp spew white-hot lava. Easy to Use Dedicated Level, Gain, Treble and Bass dials provide tons of tone-shaping options. A blue LED tells you when this wild thing is activated, and a top-quality on/off switch maintains optimum signal integrity in bypass mode. You can power it with a PSU-SB DC power supply (not included) or a 9 V battery.